Delta Pacific Seafoods is recalling Salmon Village Hot Smoked Atlantic Salmon Nuggets for possible Listeria monocytogenes contamination. This product was distributed in Canada, in Alberta, British Columbia, Manitoba, and Saskatchewan at the consumer retail level. No illnesses have been reported to date in connection with this recall. The recall was triggered by CFIA test results. 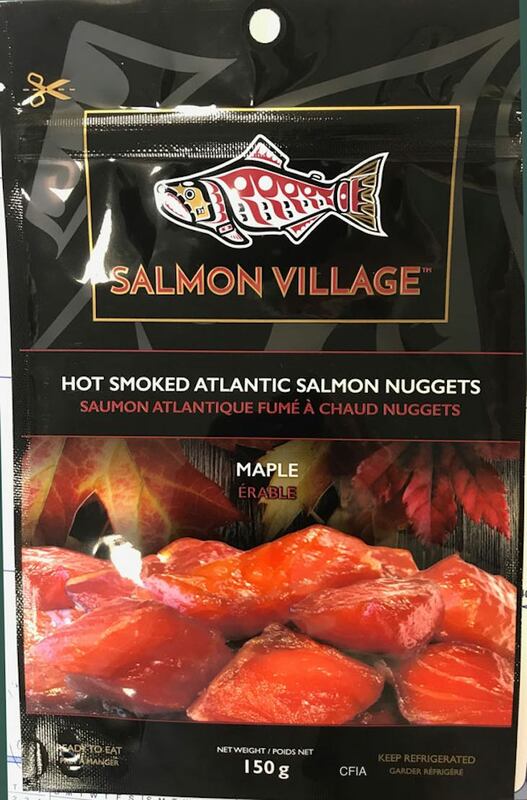 The recalled product is Salmon Village brand Hot Smoked Atlantic Salmon Nuggets – Maple in 150 gram containers. The codes on the product are 1227.18 F26.18 and all best before codes. The UPC number on the product is 8 28684 00108 9. If you bought this product, don’t eat it, even if you plan to heat it thoroughly. Discard it in a secure container in a sealed garbage can so animals and other people can’t access it. You can take it back to the store where you bought it. You should then clean out your refrigerator or freezer, or wherever you stored this product, with a solution of 1 tablespoon liquid chlorine bleach stirred into 1 gallon of warm water. Empty the appliance, wash it, and wipe down all other food containers. Wash your hands well with soap and after after cleaning and after you have touched this product. If you ate this product, you need to monitor yourself for the symptoms of listeriosis, the illness caused by this pathogen, for the next 70 days. It can take that long for symptoms to appear. Those symptoms include high fever, muscle aches, stiff neck, severe headache, nausea, diarrhea, and vomiting. Pregnant women can suffer miscarriages and stillbirth, even though their illness is mild. If you do get sick, call your doctor.